Victor Vito gave the All Blacks an early lead as he powered home with the opening try 12 minutes in before Tommy Seymour's intercept score gave the delighted hosts an immediate response. Jeremy Thrush's late score finally put daylight between the sides as New Zealand claimed their 28th win from 30 Tests against the Dark Blues. The home side's head coach Vern Cotter claimed in the build-up to the second autumn Test that the youthful side sent out by All Blacks boss Steven Hansen was packed with "stars of the future". The performance of Cotter's men in their five-try win over Argentina last week highlighted Scotland's growing attacking threat. Seymour - the scorer of an intercept try against the Pumas - repeated the trick as he pounced on Richie McCaw's loose pass and ran in unopposed for the equalising score before Laidlaw stuck over the extras. Yet New Zealand's attacking surges refused to relent. The Scots were working hard to keep them at bay but more than a few times their graft over-stepped the mark, meaning Carter could add three penalties to the scoreboard against the lone shot at the posts managed by Laidlaw. Carter's departure as he was replaced by Liam Messam was a welcome sight for Scotland but gaining ground was proving to be an almost Herculean task. With Carter off, Slade took over New Zealand's kicking duties and finally added to the All Blacks' tally 26 minutes into the second half. But Laidlaw again trimmed the world champions' lead back with his third penalty. 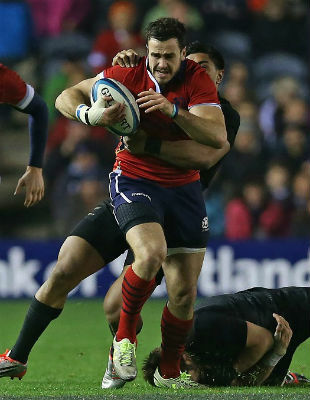 When Wyatt Crockett blocked Laidlaw's attempt to spread the play from an offside position, Scotland were handed the chance to nudge themselves in front with another penalty. But as the excitement grew, the sold-out Murrayfield was suddenly hushed as the skipper missed with his boot for the first time.